View More In Brush Cleaners. ●Come on to have your own makeup brush cleaning mat, and you'll be more amazing with perfect makeup. ●It is easy and effective for cleaning the brush. ●With different patterns of silica gel, the annoying washing process can be made very simple and efficient. Any degree of difficulty of brush cleaning will be resolved for good! Makeup brush holder： ●Drying brushes after washing, right way to hold brushes and won't take up too much space. ●Holds up to 28 broshes - You can put all your brushes on it evenly. ●It prevents brushes bristles from deforming or distorting,extends the life of your brushes. 1.There is a brown protective sticker on the brush tower. Please remove it before using! It comes off easily when the brown cardboard is wet. Just put the brush holder under warm running water and rub it a bit and then start at the corner to peel it off. ●It can be assembled in 5 minutes by anyone. ✿Essential makeup brush drying rack for drying brushes after washing-more convenient to hold brushes and won't take up too much space, gain more professional makeup experience. ✿High quality perforated silicone rubber grabs the handles well, and is gentle to bristles too. 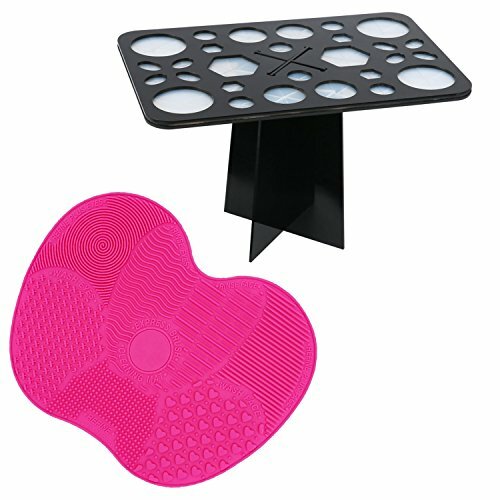 ✿The brush drying tower is made from bright black Acrylic rubber and carefully planished, soft and stable, won't hurt your hands and brushes. If you have any questions about this product by LYNN, contact us by completing and submitting the form below. If you are looking for a specif part number, please include it with your message. USB Rechargeable Makeup Brush Cleaner - Electronic Spinner Automatically Cleans Virtually ANY Brush Size in Exclusive New Patented Collar Design. Thoroughly Cleans and Dries your Brushes in Seconds.